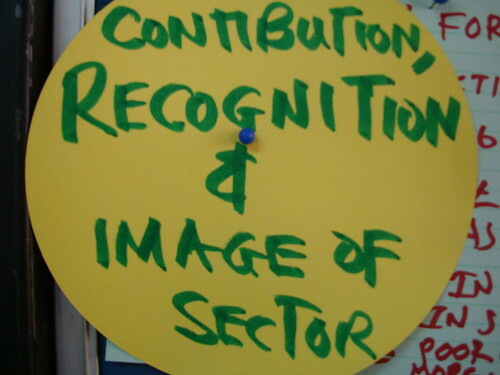 Through photographs and quotations, this photofilm celebrates a visit Angela Merkel, the Chancellor of Germany, paid to the Nairobi headquarters of the International Livestock Research Institute (ILRI) on 12 July 2011. This afternoon, staff at the Nairobi headquarters of the International Livestock Research Institute (ILRI) are holding their annual Christmas/holiday party, so we’re in an early festive mood and think this as good a time as any to post this ILRI photofilm (marriage of still photographs with sound) of a visit German Chancellor Angela Merkel paid to ILRI on 12 July 2011, which happened to be the last day of work of Carlos Seré, whose ten-year tenure as director general of ILRI was ending. The visit went well, with the sun—and ILRI’s newly refurbished and state-of-the-art biosciences laboratories—shining and ILRI’s young bioscientists from across Africa and other parts of the world standing ready to provide the Chancellor with a lab coat, a theory, an answer, an explanation—and, as you shall see in the photofilm, a smile. Take a look at the 2-minute photofilm. And allow us to take this early holiday moment in Nairobi to wish you early season’s greetings. 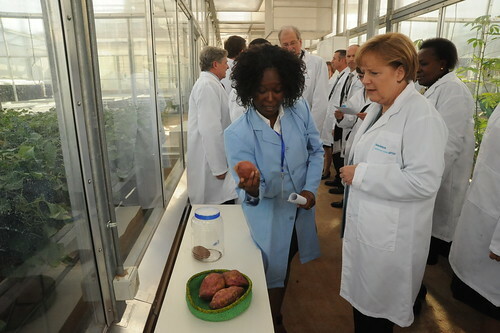 In Nairobi, German Chancellor Angela Merkel puts on lab coat, meets young bioscientists fighting hunger in Africa, 13 Jul 2011. 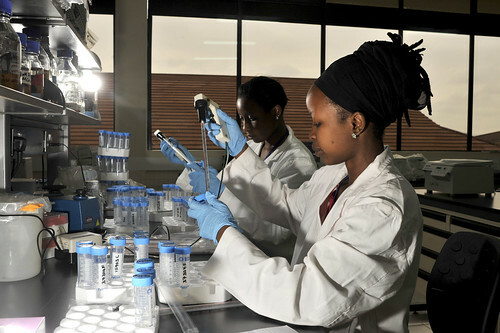 Germany’s Chancellor Merkel to tour ILRI’s advanced biosciences labs in Nairobi today, 12 July. German chancellor and minister of agriculture and Kenyan ministers of agriculture and health visit ILRI’s research laboratories, 13 Jul 2011. Germany and ILRI sign agreement in Nairobi to collaborate in research to assess the pastoral-livestock-wildlife benefits from Kenya’s eco-conservancies, 13 Jul 2011. German Chancellor Angela Merkel, German Agriculture Minister Ilse Aigner, and Carlos Seré, director general of the International Livestock Research Institute (ILRI), at ILRI’s campus in Nairobi, Kenya, 12 July 2011 (photo credit: ILRI). 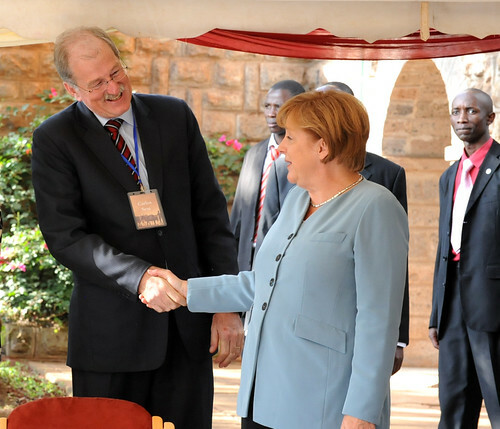 Chancellor Angela Merkel of the Federal Republic of Germany visited Kenya today (Tue 12 Jul 2011) as the first part of a three-day, three-nation, African tour. This morning, in the presence of the Chancellor, Merkel’s ambassador to Kenya, Ms Margit Hellwig-Boette, signed an agreement between Germany and the International Livestock Research Institute (ILRI), which is headquartered in Kenya. The signing ceremony was part of a press conference given by Kenyan Prime Minister Raila Odinga at Nairobi’s Intercontinental Hotel. 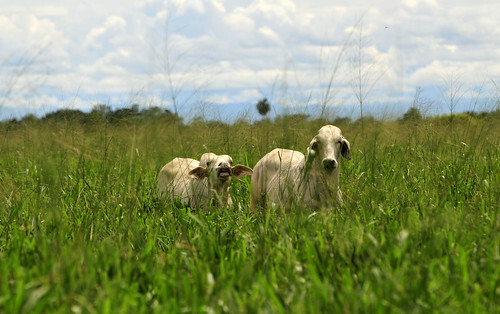 Germany has been one of ILRI’s top donors for many years, contributing more than USD11 million in just the past six years. The new agreement Germany and ILRI signed launches a project Germany is funding in Kenya to be led by ecology researchers at ILRI and local partners in Kenya. The study will assess the state of Kenya’s ‘eco-conservancies’, which strive to benefit both Kenya’s wildlife and the pastoral people who have been stewards of wildlife in this country for centuries. 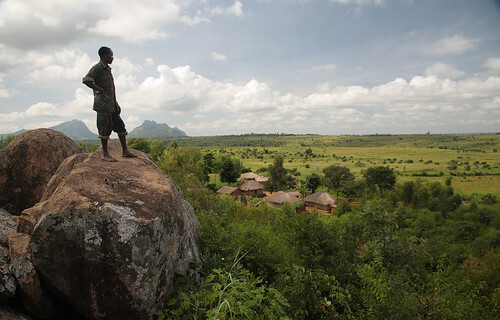 The study will examine the benefits accruing from the establishment of these eco-conservancies in terms of both wildlife conservation and poverty reduction among Kenya’s pastoral communities. Following the signing ceremony, attended by ILRI Director General Carlos Seré and ILRI’s Director of Partnerships and Communications Bruce Scott, Chancellor Merkel attended a State luncheon given by President Mwai Kibaki, to which ILRI’s director general was also invited. Chancellor Merkel then proceeded to the University of Nairobi, where she gave a keynote address. Later in the afternoon, the Chancellor paid a visit to ILRI’s campus, in Nairobi’s Kabete suburb. Chancellor Merkel was met by ILRI Director General Seré, who welcomed her with a few remarks, noting in particular the key role science can play in helping the world feed its growing human populations. The ILRI director general then described the benefits of ILRI-German partnerships over many years in diverse fields, from climate change adaptation to carbon sequestration schemes to vaccine development, all conducted in Kenya; to increasing water-use efficiencies on mixed crop-livestock farms in the Nile Basin; to forestalling parasite drug resistance in West Africa; to ensuring safe milk, meat and egg production and marketing in southern Africa. 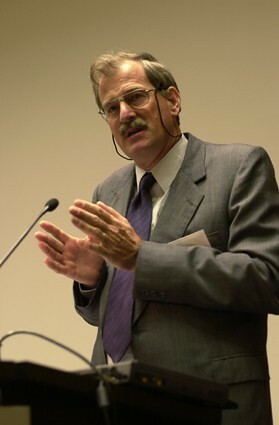 Seré concluded by requesting the Chancellor’s help in raising awareness in Germany and elsewhere of the importance of science in helping this continent to become food secure. ‘Please tell your listeners that science partnerships in this matter matter,’ said Seré. Chancellor Angela Merkel making a few remarks at ILRI (photo credit: ILRI). Chancellor Merkel than made a few remarks to the ILRI and diplomatic communities assembled outside ILRI’s new greenhouse. 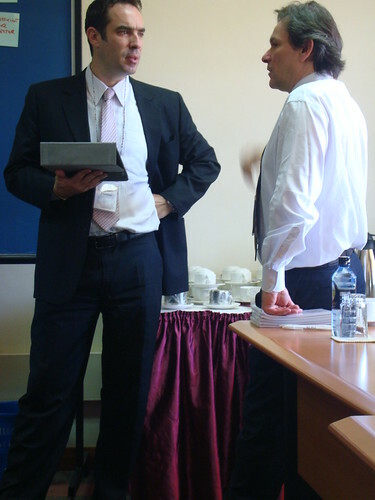 After this, ILRI’s Carlos Seré and Bruce Scott led the German Chancellor on a tour of a few of ILRI’s advanced biosciences laboratories, where Merkel spoke to several scientists about their research on the crops and farm animals that are the mainstay of poor people throughout the developing world. ILRI Director General Carlos Seré and German Chancellor Angela Merkel at ILRI (photo credit: ILRI). The afternoon ended with ILRI’s Carlos Seré thanking the Chancellor for taking the time in her busy schedule to see at first-hand some of the high-quality and relevant science being conducted in Africa to solve some of Africa’s most intractable agricultural problems. One of 7 high-tech laboratories at the Biosciences eastern and central Africa Hub, a regional state-of-the-art science platform hosted and managed by the International Livestock Research Institute (ILRI), in Nairobi, Kenya (photo credit: ILRI/David White). Germany’s Chancellor Angela Merkel has arrived in Kenya. Her busy one-day visit to this country, the first of three countries she is visiting on her African tour, includes talks with Kenya President Mwai Kibaki and Prime Minister Raila Odinga. As reported in Kenya’s Daily Nation newspaper on Sunday, Merkel will also hold a joint press conference with Prime Minister Odinga. 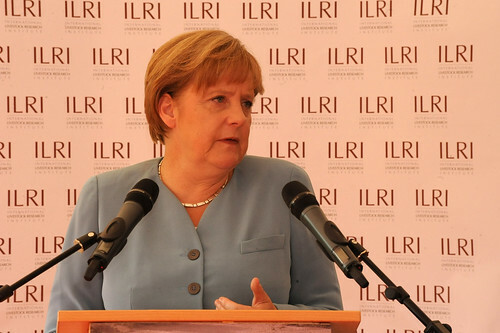 At the press conference, to be held at the Intercontinental Hotel, in Nairobi’s city centre, Chancellor Merkel will sign a new agreement between her government and the International Livestock Research Institute (ILRI), which is headquartered in Kenya. 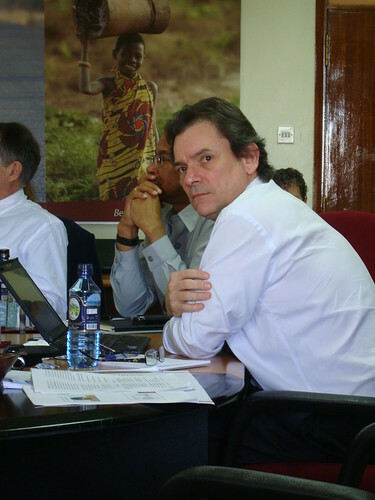 ILRI Director General Carlos Seré and Director for Partnerships and Communications Bruce Scott will attend the prime minister’s press conference and take part in the signing ceremony. 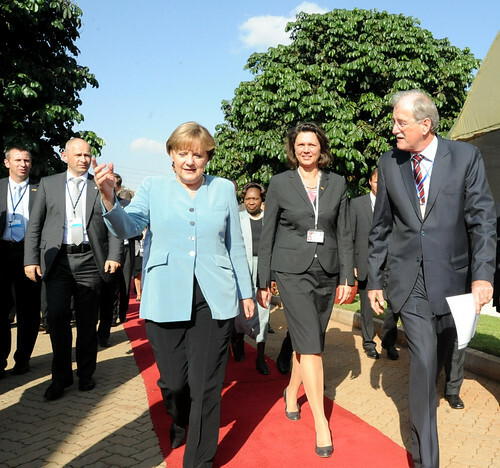 Chancellor Merkel and ILRI’s Carlos Seré will then attend a State luncheon hosted by President Kibaki at State House. After the luncheon, Chancellor Merkel is scheduled to give a speech at the University of Nairobi. 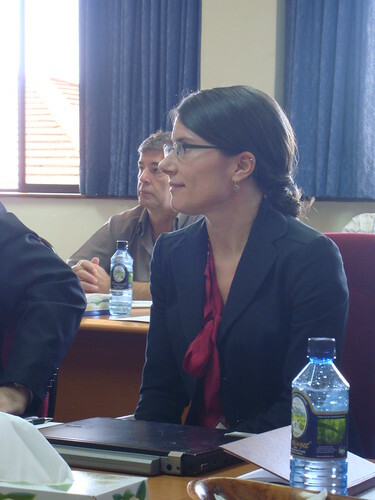 She will then pay a visit to ILRI’s headquarters, in the suburb of Kabete, where she will tour ILRI’s farm and labs, be introduced to some of the research partnerships her country is involved in, and give an address to the ILRI and diplomatic community. 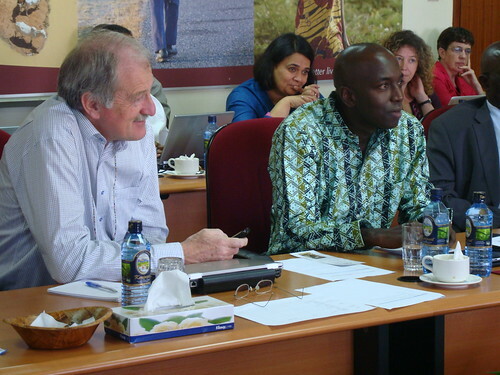 President Kibaki is quite familiar himself with ILRI’s research. 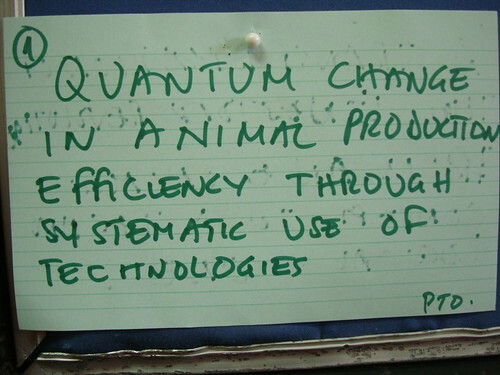 The president toured the laboratories at ILRI/BecA late last year (17 Nov 2010) when he officially launched the BecA Hub. And just last Friday (8 Jul 2011), the president paid a visit to an ILRI exhibit at the launch of his government’s ‘Open Data Web Portal,’ the first of its kind in Africa, at the Kenyatta International Conference Centre. At this launch, the president and several of his ministers as well as some 1,000 (techie) participants heard from ILRI scientist Andrew Mude, who presented to them a novel livestock insurance product that ILRI has initiated with private and public partners for poor livestock herders living in Kenya’s northern pastoral lands. After her busy day today in Nairobi, Chancellor Merkel departs tonight (Tue 12 Jul 2011) for Angola before going on to Nigeria. 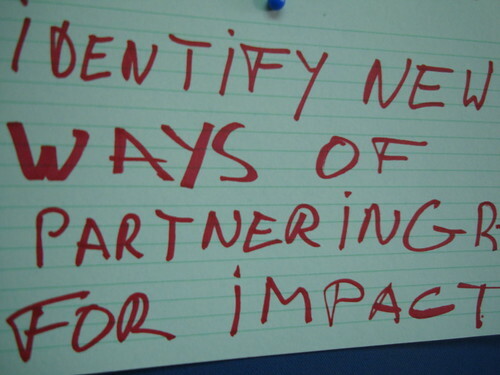 This is a red-letter day for ILRI for another reason. 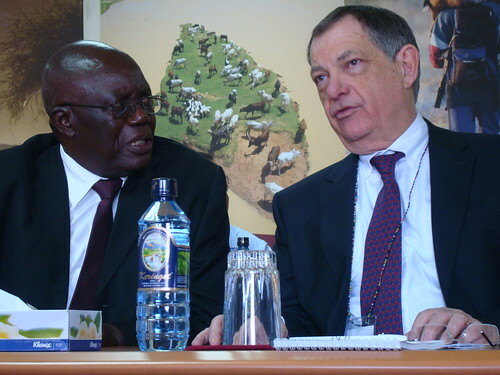 ILRI Director General Carlos Seré, an agricultural economist from Uruguay, and his wife, Chrysille Seré, from Germany, will also be departing Kenya tonight, as it is the director general’s last official day in his Nairobi office. 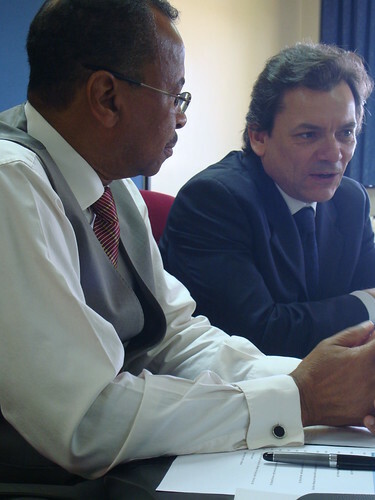 Carlos Seré has led ILRI for ten years, having started his tenure in January 2002. He is going on summer leave starting tonight. On 1 October of this year, Jimmy Smith, an animal scientist and policymaker from Guyana, now at the World Bank, will take over from Carlos Seré as director general of ILRI. ILRI has had several informal goodbye parties for the Seré’s and will have one more opportunity to wish him well in the new position he is taking up in Rome at the International Fund for Agricultural Research (IFAD) at a 1.5-day ‘Seré Seminar’ that will take place this November in Addis Ababa to look back at Seré’s 10-year ILRI legacy and forward to new leadership under Smith. Read the whole article in the Daily Nation: German leader jets in Tuesday, 10 Jul 2011. An extensive agricultural landscape typical of central rural Malawi (photo credit: ILRI/Mann). Agricultural systems analyst Mario Herrero, who leads a Sustainable Livestock Futures group at the International Livestock Research Institute (ILRI) in Kenya, gave a slide presentation last November at an invitation-only US National Academy of Sciences’ scoping meeting on The role of animal agriculture in a sustainable 21st century global food system, held in Washington DC’s Dupont Circle. Among the conclusions Herrero makes in his slide presentation, Food security, livelihoods and livestock in the developing world, is the need to change our agricultural investment paradigms so that we invest not only in the high-potential agricultural lands of the past (many of which, he says, are already ‘maxed out’), but also in the agricultural lands of the future. What are these ‘agricultural lands of the future’? 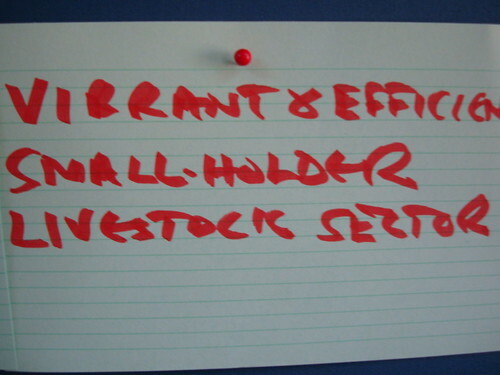 Well, those on which relatively extensive mixed crop-and-livestock systems are being practiced, for one. 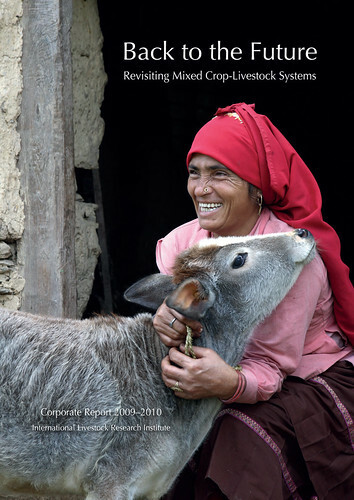 For more on this topic, see ILRI’s current corporate report: Back to the future: Revisiting mixed crop-livestock systems, 2010, the foreword of which, by ILRI director general Carlos Seré and ILRI board chair Knut Hove, follows. that will feed the world over the next two decades. A hitherto disregarded vast group of farmers—those mixing crops with livestock on ‘in between’ lands—neither high-potential farmlands nor low-potential rangelands—are heavyweights in global food security. This year’s corporate report by the International Livestock Research Institute (ILRI) looks ‘back to the future’—to the thousand million farmers practicing small-scale mixed crop-and-livestock agriculture in poor countries—the kind of seemingly old-fashioned family farming systems that have become so fashionable in recent years among those wanting to reform the industrial food systems of rich countries. Scientists at ILRI and seven other leading international agricultural research organizations around the world recently looked at the future of this form of farming and determined that it is ‘mixed farms’—not breadbaskets or ricebowls—that will feed most people over the next two decades. 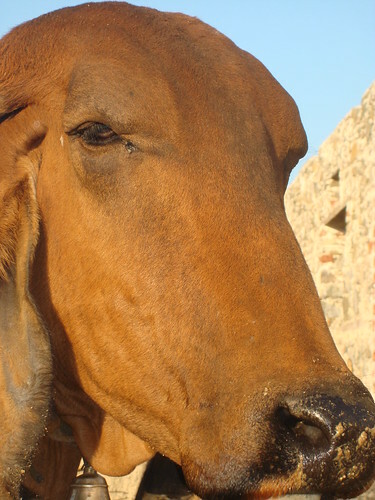 Their report shows that it is not big efficient farms on high potential lands but rather one billion small ‘mixed’ family farmers tending rice paddies or cultivating maize and beans while raising a few chickens and pigs, a herd of goats or a cow or two on relatively extensive rainfed lands who feed most of the world’s poor people today. This same group, the report indicates, is likely to play the biggest role in global food security over the next several decades, as world population grows and peaks (at 9 billion or so) with the addition of another 3 billion people. Remarkably, this is the first study ever to investigate the state of the world’s most prevalent kind of farmers—those who keep animals as well as grow crops. A major implication of the new report is that governments and researchers are mistaken to continue looking to high-potential lands and single-commodity farming systems as the answer to world hunger. As the study shows, many highly intensive agricultural systems are reaching their peak capacity to produce food and should now focus on sustaining rather than increasing yields. The authors of this multi-institutional and multi-disciplinary study, most belonging to centres of the Consultative Group on International Agricultural Research (CGIAR), agree with many other experts that we need to bring our focus back to small-scale farms. But this report goes further, distinguishing one particular kind of small-scale farmer that should be our focus: this is the mixed farmer growing crops and raising animals in the world’s more extensive agricultural systems, which are described in detail on the next page. These ‘mixed extensive’ farms make up the biggest, poorest and most environmentally sustainable agricultural system in the world. It is time we invested heavily in this particular kind of farming system. Here is where there remain the biggest yield gaps. Here is where we can make the biggest difference. The billions of dollars promised by the international donor community to fund small-scale farming in developing countries are likely to fail unless policies are reoriented towards this particular, most ubiquitous, and till now most neglected, form of agriculture. What this ‘extensive frontier’ needs are the most basic forms of infrastructure and services. With these at hand, the world’s extensive mixed farmers will be in good position to scale up their food production to meet future needs. 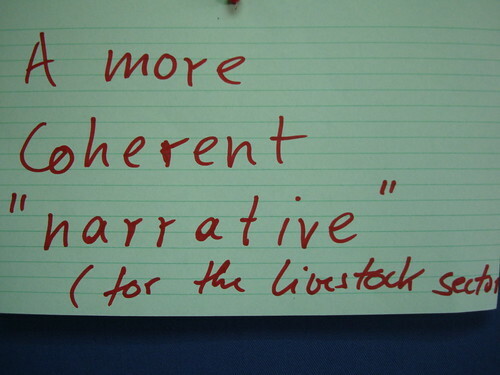 Read ILRI’s corporate report: Back to the future: Revisiting mixed crop-livestock systems, 2010. Watch a 4-minute ILRI photofilm (audio with still pictures) illustrating the importance of small-scale mixed crop-and-livestock farmers: Tribute to the Unsung Heroes of Small-scale Food Production, 2011. 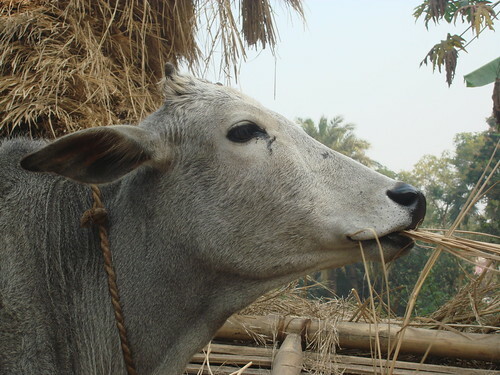 Those wanting more detail on the future of mixed farming should consult the research report by the CGIAR Systemwide Livestock Programme: Drivers of change in crop-livestock systems and their potential impacts on agroecosystems services and human well-being to 2030, 2009. 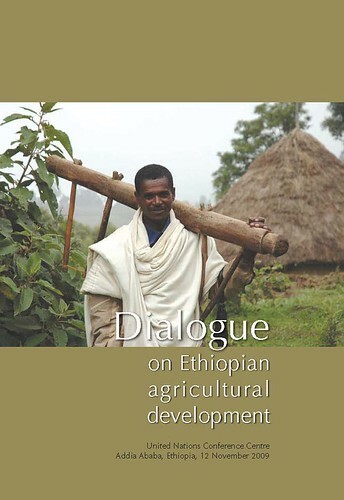 Cover of the ILRI-published proceedings of a 2009 Dialogue on Ethiopian Agricultural Development (cover image credit: ILRI/Mann). Proceedings of a comprehensive review of the history and current state of Ethiopia’s agricultural development, made in a 2009 ‘Dialogue on Ethiopian Agricultural Development’ held in Addis Ababa have been published by the International Livestock Research Institute (ILRI). 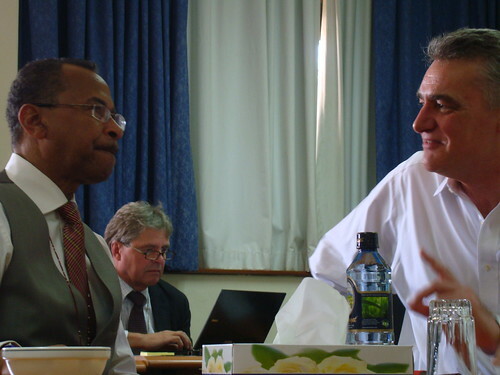 The 2009 Dialogue was jointly organized by Ethiopia’s Ministry of Agriculture and Rural Development and ILRI to honour Gebisa Ejeta, winner of the 2009 World Food Prize. 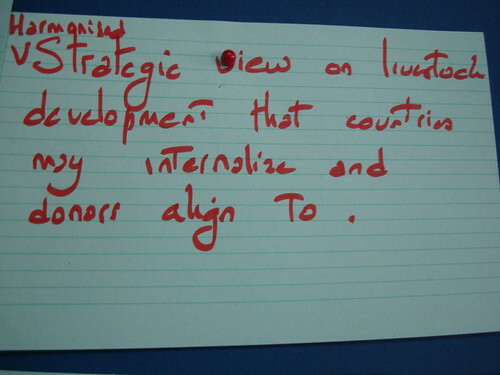 Held on 12 November 2009 at the United Nations Conference Centre, the Dialogue was opened by Ethiopian President Ato Girma Woldegiorgis. Gebisa received the prestigious prize on 15 October 2009 at Iowa’s state capital, Des Moines, USA. His research with sorghum hybrids resistant to drought and the devastating Striga weed have dramatically increased the production and availability of one of the world’s five principal grains and enhanced the food supply of hundreds of millions of people in sub- Saharan Africa. Gebisa’s high academic standing in his undergraduate years paved the way to financial assistance and entrance into higher education institutions, leading to his bachelor’s degree in plant science in 1973 from the Alemaya College of Agriculture. In 1973 his mentor Berhane Gebre-Kidan introduced Gebisa to a renowned sorghum researcher, John Axtell of Purdue University, who invited him to assist in collecting sorghum species from around Ethiopia. Axtell was so impressed with Gebisa that he invited him to become his graduate student at Purdue University. Gebisa entered Purdue University in 1974, earning his PhD in plant breeding and genetics. He later became a faculty member at Purdue, where today he holds a distinguished professorship. Gebisa’s dedication to helping poor farmers feed themselves and their families and rise out of poverty has propelled his life’s work. At the Dialogue, he spoke on science-based agricultural development with particular emphasis on Ethiopia. Abera Deressa, state minister of the Ministry of Agriculture and Rural Development; Solomon Assefa, director general of the Ethiopian Institute of Agricultural Research; Belay Kassa, president of Haramaya University, made presentations on the challenges, opportunities and achievements of agricultural research in Ethiopia and the role of agricultural universities. These presentations were followed by others, including one by Carlos Seré, director general of ILRI, and a panel discussion by representatives of key institutions and universities. 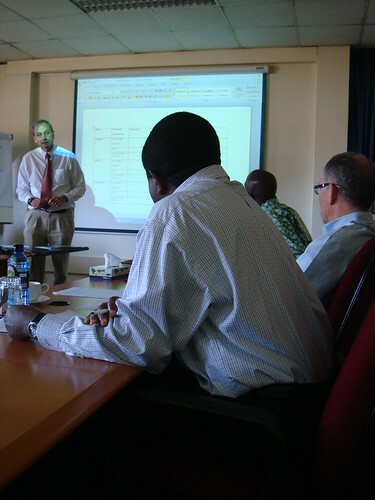 This ILRI proceedings volume includes all the papers presented and slide presentations given and transcripts of the panel discussion. Some excerpts of the presentations follow. Find all these presentations and more in Dialogue on Ethiopian Agricultural Development, held at United Nations Conference Centre, Addis Ababa, Ethiopia, 12 November 2009, published by ILRI in 2011.